Welcome to another edition of Saturday (Errr Thursday) Morning Cartoons! Now I realize this is later in the day than usual and it has nothing to do with the fact that I’ve been watching Rogue One’s trailer on repeat since it debuted. Nope Totally Not That. Anyways... This week we’re watching The Weekenders! In “Crush Test Dummies” we’re introduced to the group dynamic, set up for the premise of the show (admittedly a simple one), and dropped right into a new conflict for the episode. I wish more modern cartoons could follow this example, we don’t need giant exposition dumps right at the start of the first episode! Granted, Tino breaks the fourth wall and does his exposition right to the viewer, but that’s his schtick. The conflict of the episode centers around Carver and Tino overhearing part of a conversation that convinces them that Lor is in love with Carver. Of course, she isn’t, she’s crushing on another kid Thompson who has a blue mohawk. This leads to some rather mature humor as Tino and Carver freak out, Tino’s mom delivers some world weary advice, and Trish tries to help Lor win Thompson over. “Super Kids” starts off with a funeral. This being The Weekenders, the funeral is for the death of Carver’s weekend. It brings in the twelve year old motivational speaker Trip Nickerson. He brings in the idea of working towards a goal. The problem is that he talks of working without play and demonizes the group for not having any “Worthwhile” plans for the weekend. In true weekenders fashion we follow the group as they each try to find their own goals and work towards them, until they realize that maybe all work and no play isn’t such a good thing after all. “The Most Dangerous Weekend” focuses on hypochondriacs. Tino takes some advice from the doctor and then takes it to an absolute ridiculous level. 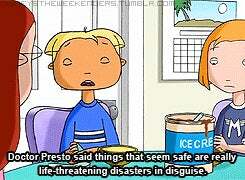 The episode then focuses on Tino freaking out over just about everything. The best thing ever from the episode is Tino applying sunscreen with a spatula and the gang reading the label. It’s spf 182 and provides better protection from UV rays than 3 feet of lead! Here are my over all thoughts of the series. Each episode comes with two separate stories, I’ve only focused on one story per episode that’s pretty nice It’s very watchable at 12 minutes a pop. Some of the running gags over the course of the series are pretty fantastic, with some highlights including the pizza place that changes from one wacky theme to another every week, Lor’s ridiculously large family, and Tino’s super sarcastic yet totally sage Mom. So, the more I’ve watched of the show, the more that I realize that even though it’s got the humor down. It’s definitely all about teaching emotional lessons. The writing’s smart, the cast is unusually progressive for when it came out, and it is definitely funny. 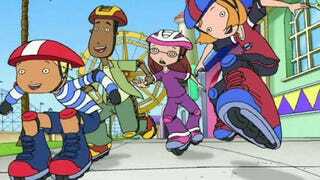 What’s everyone else’s thoughts on The Weekenders? Love it? Hate it? Think I missed the best episode (insert episode here) ever? Let me know!